I'm going to ramble a bit today on the subject of logic. (We will see how often I can tie it to the subject of crime fiction.) I am doing this because I just heard, for the millionth time, someone define Occam's razor incorrectly. Specifically, the person claimed that Occam's razor says that the simplest explanation is probably correct. One of Ockham's more distinguished, if fictional, students. In his famous quote above John Punch (what a great name!) warned us to watch out for unnecessary entities, as in someone or something that played an active part in causing an action. Punch means that if you walk outside and something knocks your hat off, you don't start out by assuming there is a malevolent invisible demon in the vicinity. It might have just been a breeze. But my point is that Punch/Occam is not saying that the simpler explanation is the most likely one. It is simply the one you should examine first. Not because it is the most likely to be correct, but because examining it is the fastest way to reach the truth. Let's take an example from our own field. The police are called to a building. They find that the store on the ground floor has been robbed, and that a man has been murdered on the third floor. Should the robbery squad be called to one crime scene and the homicide team to the other? Or are we looking at a single event? Brother William made no specific recommendations about police personnel matters, but his principle advises treating this as the "simpler" situation, i.e. one event. If the cops do that, and if they do their job properly, they are more likely to find something wrong with their solution, than if they start at the other end. Perhaps the two crimes happened at the same time, or maybe the robber was right-handed and the killer was a southpaw. But if instead they begin by assuming there were two separate criminals - and there was only one - it is going to be harder for them to realize that one of their proposed culprits is imaginary (an unnecessary entity). You may remember the TV series House, MD, which was a medical detective show, about a diagnostician (whose name was a tribute to Sherlock Holmes, by the way). In an episode called (surprise!) "Occam's Razor," the physicians are unable to explain all of a patient's symptoms with one disease, so House suggests that there are two illnesses present. His team is not buying it. Foreman: Occam's Razor. The simplest explanation is always the best. House: Baby shows up. Chase tells you that two people exchanged fluids to create this being. I tell you that one stork dropped the little tyke off in a diaper. You going to go with the two or the one? Foreman: I think your argument is specious. House: I think your tie is ugly. Leaving aside House's maturity issues, he is making a point about Dr. Foreman's misunderstanding of the 'ol razor. And that brings us, naturally, to Asimov's elephant. Imagine you are strolling through a park and see a tall tree split right down the middle. Cut asunder. You begin to seek an explanation. So you could say: there was this elephant, flying through the sky, whistling a happy tune. It decides to have a little rest and lands SHEBANG! onto the poor tree, which breaks in two. The elephant falls to the ground, swears 'Oy vay!' and flies off again. I love that 'Oy vay!' Clearly a Jewish elephant. Of course, Asimov has pointed out the problem with Dr. House's obstetrical stork. Supposedly he asked a friend: "Why do people always say it was natural for man to assume that the Sun went round the earth rather than that the earth was rotating?" "Well, obviously because it just looks as though the Sun is going around the Earth." "Well, what would it have looked like if it had looked as though the Earth was rotating?" *I found this parable in Asimov's Elephant, edited by Robyn Williams. It is a collection of essays from an Australian Broadcasting Corporation radio program called, yup, Ockham's Razor. This is just the sort of intellectual discussion post I adore! Thanks for the correct interpretation of the razor. I had that wrong. Elephant anecdote is perfect. I'll be bookmarking this page. I had never heard of the book Asimov's Elephant. 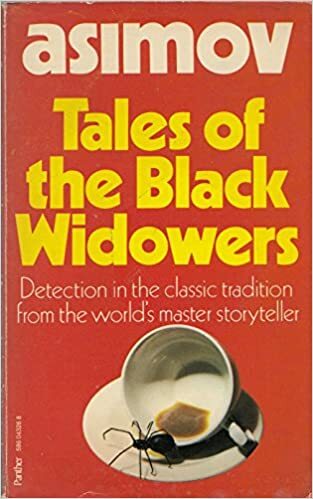 So, being a major fan of the good doctor, and of the Black Widower stories, I went immediately to the internet. It is out of print. However, someone in Amazon's marketplace would apparently be willing to sell me a copy for $350. So I went to ABE. There, I can buy a copy--to be shipped from Australia (!!!!!) --for a mere $27.25. Did no one in the US buy a copy? I thought Occam's razor says, when you consider more than one explanation for an event, and eliminate anything that isn't possible, whatever remains is the true explanation, no matter how unlikely it might seem. Or maybe I'm paraphrasing something Agatha Christie said. ? Nice post, Rob. The irony is that while Occam's Razor can be applied to a lot of things, there is nothing shiftier nor more complex nor more apt to be a demon-haunted tree or a Jewish elephant than the human mind. Which is the source of most crime. Now this is an interesting post. Had to read it a couple times. 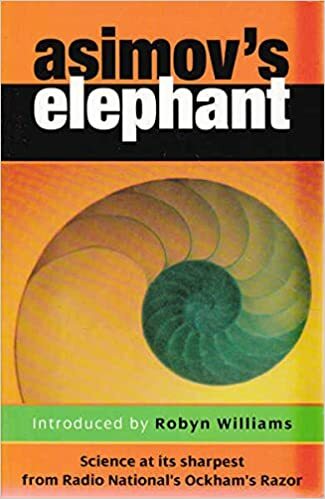 Don, just to be clear, the only part of Asimov's Elephant that mentions Dr. A. is the introduction, which contains that parable. The rest is assorted essays about science from many hands. My library borrowed it for me from a university Down Under. Elizabeth, I think you may be thinking of something Sherlock Holmes said: "Once you eliminate the impossible, whatever remains, no matter how improbable, must be the truth." Doesn't really apply to Occam's Razor.